How does a historical society keep from becoming history itself? It was a question on the minds of about 40 local historians Saturday morning in Riverhead. The historians gathered in the main exhibition gallery of Suffolk County Historical Society for the annual meeting of the Association of Suffolk County Historical Societies. 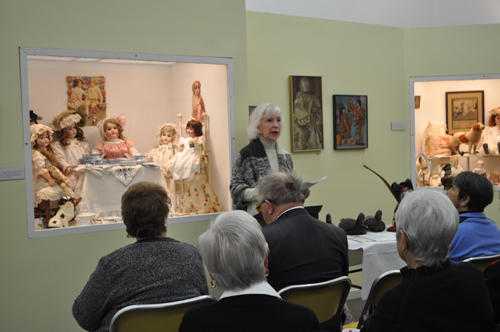 Participants were there to hear an overview of “Ageless Beauty,” the East Main Street facility’s new doll exhibit, but the day’s more pressing matter came when SCHS executive director Kathy Curran announced she would shortly be mailing surveys to all of Suffolk County’s historical societies in an effort to better understand the needs of those facilities in terms of finances and community outreach. To help facilitate this, she explained, SCHS has partnered with the Center for Nonprofit Leadership at Adelphi University and the Robert David Lion Gardiner Foundation to assess the strengths and weaknesses of the county’s historical societies so that they can grow. Based in Hampton Bays, the Robert David Lion Gardiner Foundation was founded in 1987. It supports and provides funding to historical societies across Long Island, according to its website. Organizations will not be eligible to receive grant money from the foundation unless they complete the survey, Ms. Curran said. The survey, which is part of a program called “Looking in the Mirror: Assessing the Strengths, Challenges and Future of our Suffolk County Historical Societies,” will be mailed in April, Ms. Curran said. Focus groups will take place in the summer and a symposium to discuss the questionnaire’s results will be held at SCHS in September. Securing funding is one of the key problems facing historical societies today, said Dr. Grier-Key, who’s also executive director and chief curator of the Eastville Community Society of Sag Harbor. Writing grant proposals is typically a tedious process, Dr. Grier-Key said, and historical society directors often don’t know who to turn to for guidance. Many organizations don’t have designated staff and the vast majority have aging volunteer boards. ASCHS president Gail Horton, secretary of Stirling Historical Society in Greenport, said her organization has struggled with funding and outreach in the past but is now doing “much better” because it has bolstered the number of events it hosts and held fundraisers to refurbish its archives building. But more needs to be done, she said, and addressing those needs in a survey is one way to hopefully achieve results. For example, Ms. Curran said, “I want handicap access for this building very importantly. I’m missing a gigantic population. …And it’s not just an elderly population or a handicapped population.